This post is coming to you a lot later than it should be. The main reason is because I am a lazy fatty who spent the entire weekend indulging on carbs. Deeeelicious. But I really did try to make up for it by whipping up this easy dessert on Monday. And then the sun disappeared. I'm not exaggerating, anyone who has been in Sydney will understand what I mean, it has been dark and grey with nowhere near enough natural light to take photos. And so my poor blog sat there neglected for a couple of days while I stared despondently out the window at the pouring rain. So much for a quick, easy blog post for this week! But I finally decided to give it a go after work yesterday, the light was pretty iffy so apologies if it looks a bit strange. 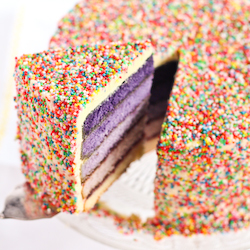 After the crazy, over-the-topness of a 5-layer ombre effect birthday sprinkle cake in my last post, I thought it might be a good idea to take a breather and do something a little less complicated. It was also stinking hot for a lot of last week, so the last thing that I felt like doing was turning on the oven. While searching through recipes on the internet I came across the one for Momofuku's strawberry pannacotta with cereal milk mousse and cornflake crumble. While I never got fully swept up by the hype that was their crack pie, I've always been very intrigued by the idea of cereal milk. I think it's such a fabulous idea, which would invoke so many childhood memories. 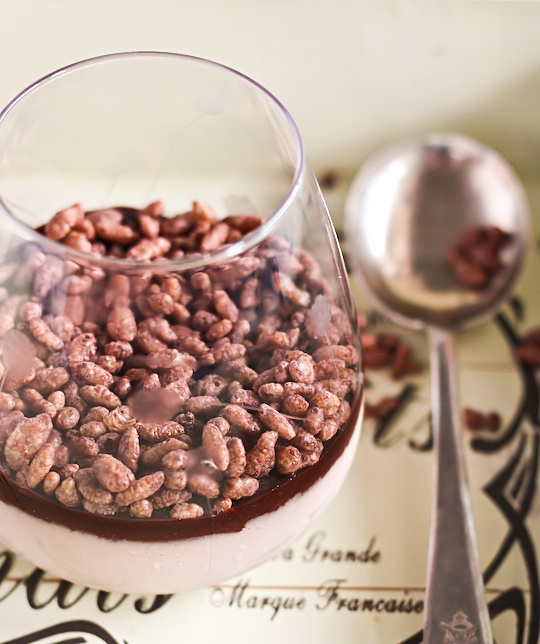 So I decided to finally give it a go, but with a little bit of a twist - instead of using cornflakes I would use one of the cereals I grew up with; Coco Pops, to make a chocolate cereal milk mousse that I would top off with even more cocoa pops. So it would be as the slogan goes, 'just like a chocolate milkshake, only crunchy'! It's funny the things you find out while coming up with recipe ideas. I had no idea that not everyone knew about the whole chocolate milkshake only crunchy thing. I grew up hearing it! I didn't know that in the US they don't call them cocoa pops, they call them cocoa krispies. Which I guess makes more sense since they're cocoa flavoured rice krispies...But then in Australia we call them rice bubbles not rice krispies, argh! And they don't have them in Canada. This made me sad. Though apparently they sell something similar so I guess that's okay. Either way, I wanted to use this cocoa flavoured cereal to make a light, chocolatey dessert with a crunchy layer on top. I was a little worried the cocoa coating on the cereal would just make the mousse have a weird fake chocolate powdery texture, which it sort of seemed like it was going to halfway through making it. But after mixing in the cream it turned into this beautiful, light, completely uniquely flavoured mousse. Take note, this is NOT a chocolate mousse. Do not make this recipe if you want a chocolate mousse. It tastes just like a bowl of cocoa pops with milk. I put a thin layer of chocolate ganache on the top of each mousse, to keep the cocoa pops on top separate so they wouldn't go soggy too quickly and it also makes up for the lack of any real chocolate in the mousse. It worked like a charm. But I did find that the cereal milk mousse was a little too firm for my liking, since the original recipe is meant to be set on top of a pannacotta. I've adjusted the amount of gelatin in the recipe so hopefully it will be a little lighter and softer. Anyway, it's a fast, fun and light dessert and if you like cocoa pops as much as I do, you should definitely make it. Preheat the oven to 135°C (275°F). On a lined baking tray, toast the cereal for 5 minutes. Set aside to cool. In a sealable container, combine the toasted cereal and milk. Let steep for 20 minutes, then strain into a measuring cup; the mixture should yield about 1 cup of 'cereal milk'. Place 1/2 cup cereal milk in a medium bowl. Sprinkle powdered gelatin on top. In a small saucepan, scald 1/2 cup cereal milk with the salt and sugar. Whisk hot milk into the cool milk until the gelatine is dissolved. Chill until almost set (I basically chilled mine and checked on it every 5 minutes until it was thick and almost going lumpy, at which point I whisked it until smooth and proceeded). Whip the cream to stiff peaks and fold it into the almost-set gelatine mixture. Pour mixture into 4 serving glasses. Chill in the fridge while preparing the topping. Put chopped chocolate in a medium heatproof bowl. Place 100ml cream in a small saucepan on medium-low heat and just bring to the boil. 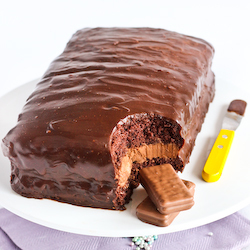 Pour hot cream over the chocolate and leave to sit for a minute to allow chocolate to melt. Use a whisk to mix, ensuring that it is smooth and all the chocolate has melted (if it hasn't, place the bowl over a pan of simmering water and stir until smooth). Leave to cool for about 5 minutes (ensure that the mixture is still pourable, otherwise you will have to reheat). Carefully pour a thin layer of the chocolate mixture over the top of each mousse glass. 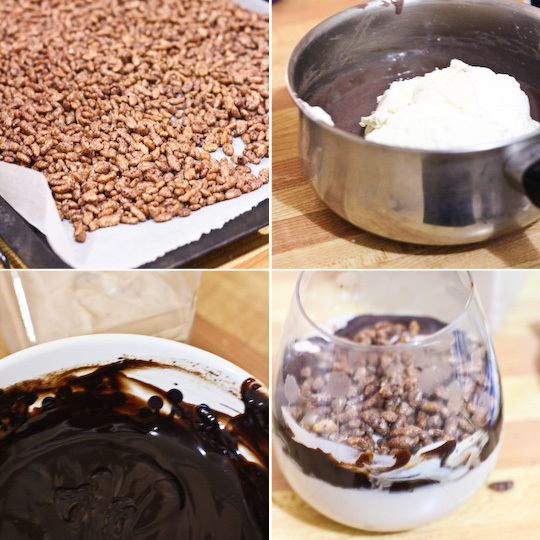 Sprinkle a layer of cocoa pops over the top. Chill until set, at least one hour. Best served on the same day to ensure cereal layer is still crunchy. Edit: Oops I just realised I spent the whole post misspelling it Cocoa Pops when it's actually Coco Pops...but I can't be bothered fixing it all through the post, sorry! 2. I can't believe that not everyone knows the slogan! Steph, you had my heart at Coco Pops <3. That looks amazing, love that last perfect spoon! This is my ideal dessert. 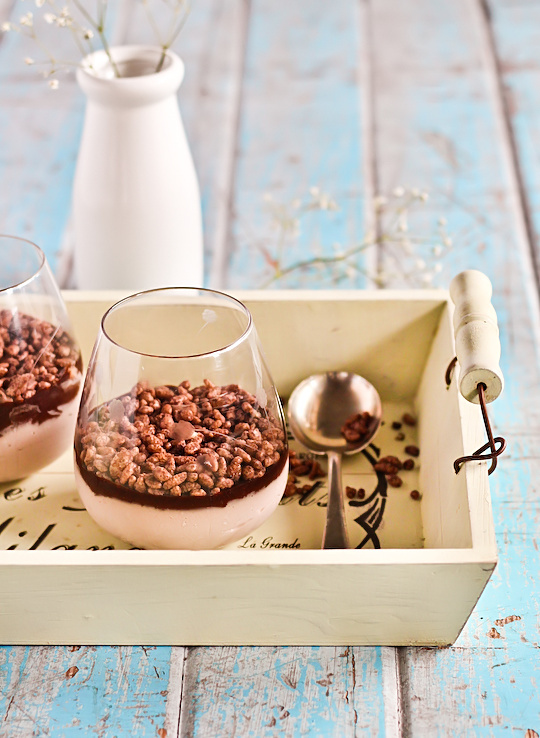 I love coco pops so much and they would work perfectly in a dessert :D good job! Totally awesome!! Love that you've captured the jingle in this dessert. I think you're pictures are great. This is such an interesting take on traditional chocolate mousse! As always, your blog is a lovely read and the photos are just stunning! 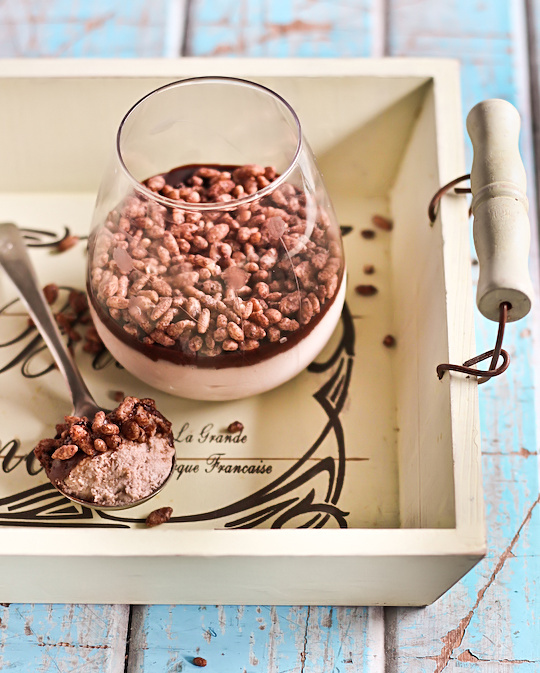 I love the idea of using coco pops in a mousse! 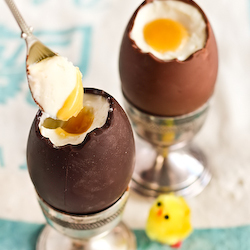 The contrast between the smooth mousse and crispy topping must be absolutely delicious. 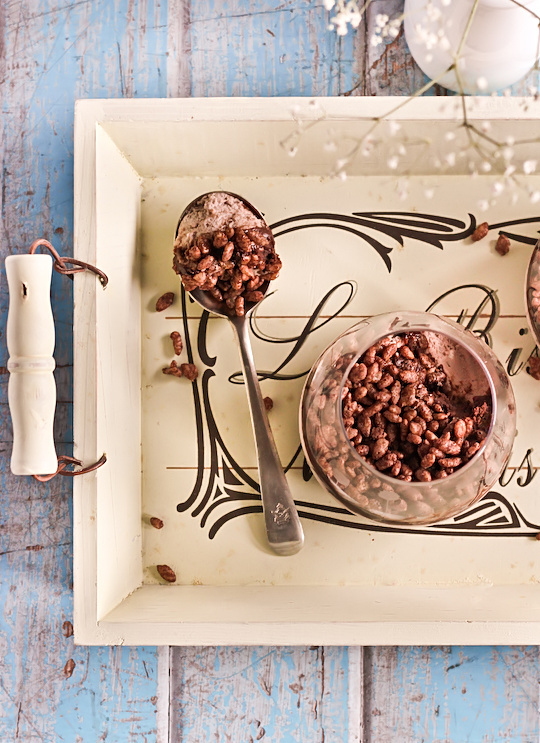 I think everyone has fond childhood memories of coco pops - what a lovely nostalgic dessert. Wow, coco pops take me back!!! They were always such a treat when I was little and the idea of a mousse sounds fantastic. Yum - breakfast for dessert! And your pictures are awesome! Oh yes oh yes oh yes! But why is this world so cruel to me? I currently have a surfeit of rice bubbles, not cocoa pops! Maybe I could mix the rice bubbles with peanut butter and make this that way.... no, that would probably fail. I shall dream of your exact recipe instead. 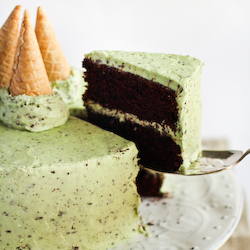 Oh my gosh this looks so delicious! I still don't understand how you thought of this!? Genius! As a graphic designer in the publishing industry, your photo's and recipes are amazing, let me know if you ever want to put together a book! Thank you for making my day, you know what I'll be craving for! I most definitely grew up with that slogan and Coco Pops are fall into my indulgent but not-quite-cereal category (much like Crunchy Nut Cornflakes which came along later). 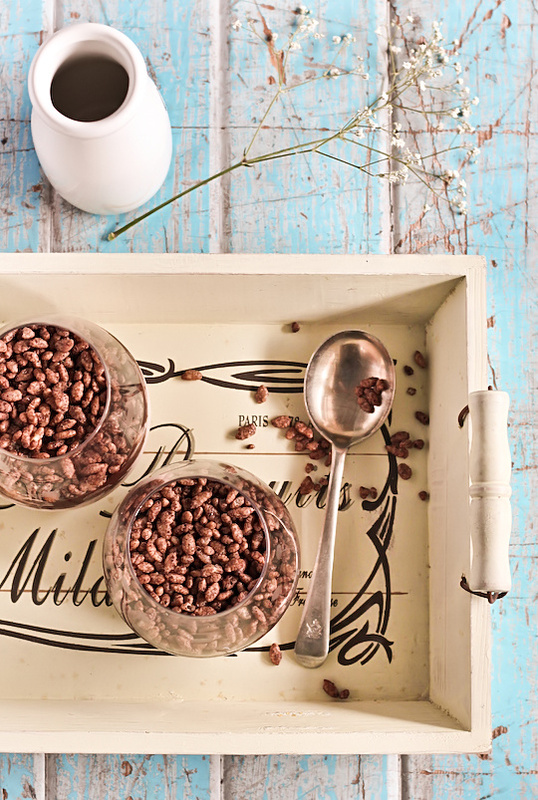 Coco Pops were one of the few ways Mum could actually get me to drink milk! it's quite long that i didn't browsing any pastry blog..
and whoops, i found yours from google..
i studied pastry for 1 semester, 2 years ago as part of my subject in university..
but i think i wasnt quite good at making them..
but this holiday i want to get more practice on it..
and it's really fun seeing lots of pretty pastries that you made..those really motivates me to take more practice..:D.. I LOVE the idea of this!! Coco pops remains one of my favourite cereals, and it goes without saying that I am most definitely trying out this recipe. You rock!